Anthony Michael Rendon (rhen-DOHN)... Is married to wife, Amanda...The couple has one daughter, Emma Kate...Earned spot on Conference USA's Academic Honor Roll during his time at Rice...Is a graduate of Lamar (TX) High in Houston...As a senior at Lamar, was named First Team 5A All-State shortstop and was an All-Greater Houston selection by the Houston Chronicle after batting .570 with eight homers, 56 RBI and 13 stolen bags...During his junior campaign, earned first team All-State honors as a shortstop in 2007, the same year he led the greater-Houston area with 14 homers...In all, was a three-time All-District selection at Lamar...Was drafted by ATL in the 26th round of the 2008 First-Year Player Draft, but didn't sign...On June 29, 2010, was honored by Houston Mayor Annise Parker and the City Council with "Anthony Rendon Day in Houston." Once again proved to be one of the top players in Major League Baseball...The most consistent all-around player on Washington's roster... Was once again a finalist for the Rawlings Gold Glove Award (NL 3B)...Recorded a career-high 44 doubles and a career-high 70 extra-base hits...Led the club and ranked in the National League in doubles (T1st, 44), batting average (4th, .308), slugging percentage (6th, .535) and extra-base hits (9th, 70)...He led qualified Nationals and ranked fifth in the National League with a .909 OPS and ranked 11th in on-base percentage (.374)...According to FanGraphs.com, ranked second in the National League in Wins Above Replacement (6.3)...Ranked sixth in the National League in OPS (.946) after the All-Star Break...Recorded a career-best 33-game on-base streak from Aug. 21-Sept. 25...Hit .369/.454/.662 during the streak...Recorded three separate hitting streaks of at least 10 games, tied for the most in the National League and the second-most in Major League Baseball...Only Kansas City's Whit Merrifield (4) and Houston's Yuli Gurriel (4) had more 10-game hitting streaks..Was hitting .254/.330/.435 on June 15...From then until the end of 2018, hit .335/.395/.585...Hit .316 against right-handed pitching, the best among National League righties (5th among MLB RHB)... Clubbed his fourth career mutli-home run game, July 12 at New York (NL). Continued his ascent as one of the top all-around players in Major League Baseball...Finished sixth in the National League MVP voting...Set career marks in nearly every offensive category while playing Gold Glove caliber defense...Was left off the National League All-Star team...Ranked in the National League in doubles (4th, 41), AVG w/RISP (4th, .375), on-base percentage (6th, .403), OPS (9th, .937) and slugging percentage (13th, .533)...81 of 100 RBI came w/RISP, third-most in the National League...He sat near the top of the Wins Above Replacement (WAR) leaderboard in both the National League and all of MLB, for a significant amount of time this season, per FanGraphs.com...Finished the season leading the NL (6.9) and ranked third in the Major Leagues -- behind only NYY's Aaron Judge (8.2) and HOU's Jose Altuve (7.5)...Another FanGraphs.com metric that showcases Rendon's value is their Defensive Runs Above Average (DEF), which measures a player's defensive value relative to a league average and comparisons across positions...Rendon (15.8) led the NL and ranked second in all of Major League Baseball behind LAA SS Andrelton Simmons (22.6)...Started the season relatively slow, but since his 6-for-6, three home run, 10 RBI on April 30 vs. NYM (more on that below), he ranked in the NL in: on-base percentage (2nd, .420), slugging percentage (3rd, .590), and OPS (3rd, 1.009)...Along with Ryan Zimmerman (36 HR, 108 RBI), Bryce Harper (29 HR, 87 RBI), and Daniel Murphy (23 HR, 93 RBI), the Nationals were the only team in the Major Leagues to boast four players with 20+ home runs and 85+ RBI...Clubbed his first career multi-home run game, May 23 vs. SEA...On July 27 vs. MIL, helped the Nationals become just the sixth team in Major League history to hit five home runs in a single inning (per Elias ) when the team hit five home runs in the fourth inning...Clubbed his second career grand slam, July 15 at CIN (Wood)...Hit his second career Postseason home run, a solo shot in the first inning (Lester) of Washington's Game 2 win. Played in a career-high 156 games while ranking among Nationals hitters in runs scored (1st, 91), hits (2nd, 153), doubles (2nd, 38) and RBI (3rd, 85)...Despite a slow April (.242, 4 2B, RBI), from May 1 through the end of the season, he hit .275 with a .355 on-base percentage and a .481 slugging percentage...He emerged as one of the top run producers after the All-Star break, ranking fifth in the National League in RBI (52) over that stretch... He recorded 23 RBI in the month of September, the most of a single month in his young career...Lived up to his nickname "Tony Two Bags" in leading National League third basemen with 38 doubles, one short of a career high (39 in 2014)... Ranked first among National League third baseman with a .976 fielding percentage ahead of COL 3B Nolan Arenado (973)...Hit his first career grand slam, Sept. 6 vs. ATL (Perez)...Recorded his 500th career hit, a three-run home run in the bottom of the eighth inning on Sept. 27 vs. ARI (Delgado), putting the Nationals ahead, 4-2...With his home run on Sept. 30 vs. MIA (Cashner) - his 20th of the season - the Nationals became one of four teams in MLB with at least six 20+ home run players in 2016... Washington was joined by BAL, TOR and STL...For a brief moment (approximately 20 minutes) the Nationals were just the third team in National League history to boast six players with at least 20 home runs (1965 Milwaukee Braves and 2003 Atlanta Braves)...STL OF Matt Holliday then hit his 20th home run of the season the same night as Rendon, making the Cardinals the fourth team in NL history to accomplish the feat...Clubbed his first career Postseason home run, a two run shot in the third inning of Washington's 8-3 Game 3 NLDS win (Maeda). Suffered a sprained MCL in his left knee while diving for a ball during Spring Training, causing him to open the season on the disabled list...Was activated from the disabled list and made his 2015 debut, June 4 vs. CHI...Appeared in 18 games, hitting .290 (20-for-69) with five doubles, five RBI, nine walks and nine runs scored before returning to the DL on June 25 with a left quad strain...Was reinstated on July 25...Hit .356 (37-for-104) with four doubles, four homers, 16 RBI, 12 walks and 25 runs scored from Aug. 22-Sept. 17...Posted a career-best 12-game hitting streak, Aug. 22-Sept. 3...Hit .362 (17-for-47) with three doubles, two homers, nine RBI and 14 runs during streak...Matched a career high with four hits and clubbed his second career leadoff home run, Sept. 14 at PHI (Nola). In first full big league season, posted MVP-level numbers (was 5th in the NL MVP voting) en route to his first NL Silver Slugger Award...Was recognized as the top slugging NL third baseman after hitting .287 with 39 doubles, six triples, 21 home runs, 83 RBI, 58 walks and 111 runs scored in 153 games...Ranked fourth in MLB (2nd in NL) in Wins Above Replacement (6.6), according to Fangraphs.com...His 111 runs paced the NL (3rd in MLB)...The last DC-based player to lead a league in runs was George Case (AL: 102 in 1943)...Became just fourth National to eclipse the 100-run threshold: A.Soriano (119, 2006), R.Zimmerman (110, 2009), N.Johnson (100, 2006)...Ranked among NL leaders in hits (T5th, 176), total bases (3rd, 290), doubles (T4th, 39), extra-base hit (T5th, 66) and times on base (10th, 239)..Hit .313 against LHP, but 18 of 21 home runs were hit against RHP... Collected a career-high four hits on five separate occasions...On Opening Day at New York Mets, clubbed a blasted a three-run go-ahead home run to provide the cushion in Washington's 9-7 win...On April 30, playing in his hometown of Houston, went 4-for-5 with two doubles, one home run and three RBI in Washington's 7-0 win...Tied a Nationals single-game record (2005-pres.) when he recorded three doubles, July 5 vs. Chicago...Hit .368 (7-for-19) with one RBI and one walk in the NLDS vs. San Francisco Giants, his first Postseason exposure. Despite learning new position (2B) on the fly, hit .265 with 23 doubles, 7 homers and 31 walks in strong MLB debut...saw Nationals rookie-record 4.06 pitches per plate appearance (would have ranked 10th in NL if qualified)...23 doubles ranked 4th among NL rookies...debuted in the big leagues on April 21 at NYM…first MLB hit was a double off Shelby Miller, April 22 vs. STL...posted game-high 3 RBI in a 7-0 win in afternoon affair of June 9 twinbill vs. MIN...first big league homer was a 9th-inning solo shot that capped the scoring in a 7-6 win on June 15 at CLE. Played in just 43 games at 4 levels in professional debut after suffering a severe left ankle sprain by while rounding third base for Single-A Potomac in season's 2nd game, April 7 at Lynchburg...missed 3+ months and returned to field on July 19 with Rookie-level GCL Nationals...blasted first pro homer on July 23 vs. GCL Marlins...by season's end, hit .233 and tallied 18 extra-base hits, including 6 homers, and 23 walks at 4 levels in Washington's system...was with Double-A Harrisburg at completion of '12...following season, played in 22 games for Salt River in the prestigious Arizona Fall League and hit .338 / .436 / .494 / .930 (batting, OBP, SLG, OPS)...legged out 10 doubles (2nd in AFL) and excelled defensively at the hot corner to garner a spot on AFL's Top Prospect Team. Was rated by industry-insider Baseball America as the top position player in the 2011 Draft after starring as the college game's top offensive threat the previous three seasons ('09-11). Signed late ... participated in the Nationals' Florida Instructional League program, but was held out of game action while continuing to strengthen right shoulder. July 31, 2018 Washington Nationals activated 3B Anthony Rendon from the bereavement list. July 29, 2018 Washington Nationals placed 3B Anthony Rendon on the bereavement list. July 26, 2018 Washington Nationals placed 3B Anthony Rendon on the paternity list. May 5, 2018 Washington Nationals activated 3B Anthony Rendon from the 10-day disabled list. 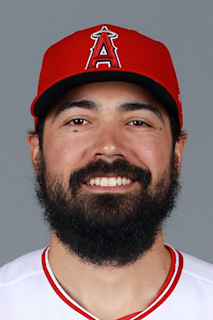 May 3, 2018 Washington Nationals sent DH Anthony Rendon on a rehab assignment to Potomac Nationals. April 22, 2018 Washington Nationals placed 3B Anthony Rendon on the 10-day disabled list retroactive to April 19, 2018. Toe contusion. July 25, 2015 Washington Nationals activated 3B Anthony Rendon from the 15-day disabled list. July 18, 2015 Washington Nationals sent 2B Anthony Rendon on a rehab assignment to Potomac Nationals. June 4, 2015 Washington Nationals activated 2B Anthony Rendon from the 15-day disabled list. May 29, 2015 Washington Nationals sent 3B Anthony Rendon on a rehab assignment to Harrisburg Senators. April 24, 2015 Washington Nationals sent 3B Anthony Rendon on a rehab assignment to Harrisburg Senators. April 5, 2015 Washington Nationals placed 3B Anthony Rendon on the 15-day disabled list retroactive to March 27, 2015. Sprained left knee. June 4, 2013 Washington Nationals recalled 3B Anthony Rendon from Syracuse Chiefs. June 1, 2013 Anthony Rendon assigned to Syracuse Chiefs from Harrisburg Senators. May 3, 2013 Washington Nationals optioned Anthony Rendon to Harrisburg Senators. April 21, 2013 Washington Nationals recalled Anthony Rendon from Harrisburg Senators. March 14, 2013 Washington Nationals optioned Anthony Rendon to Harrisburg Senators. October 15, 2012 Anthony Rendon roster status changed by Washington Nationals. August 14, 2012 3B Anthony Rendon assigned to Harrisburg Senators from Potomac Nationals. August 7, 2012 Anthony Rendon roster status changed by Potomac Nationals. July 25, 2012 sent 3B Anthony Rendon on a rehab assignment to Auburn Doubledays. July 19, 2012 sent 3B Anthony Rendon on a rehab assignment to GCL Nationals. April 10, 2012 Potomac Nationals placed 3B Anthony Rendon on the 7-day disabled list. March 12, 2012 Washington Nationals optioned 3B Anthony Rendon to Potomac Nationals. October 6, 2011 Anthony Rendon roster status changed by Washington Nationals. August 15, 2011 Washington Nationals signed 3B Anthony Rendon.